FACT CHECK: Umpqua Community College Is a Gun-Free Zone? Umpqua Community College Is a Gun-Free Zone? Rumor: Umpqua Community College was a gun-free zone when nine people were fatally shot there in October 2015. 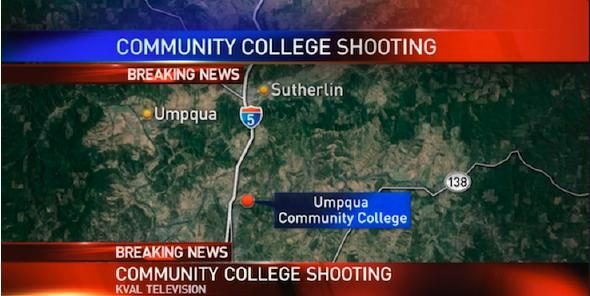 Claim: Umpqua Community College was a gun-free zone when nine people were fatally shot there in October 2015. Donald Trump called in to “Fox and Friends Weekend” today and weighed in on a variety of topics, including the tragic Oregon shooting. Origins: Mass shootings at schools are an all-too-frequent occurrence in the United States, and each instance of that form of tragedy prompts public renewed debate over whether tighter or looser restrictions on the ownership and carrying of firearms would reduce the chances of future massacres. Proponents of the latter often cite schools as institutions that are particularly vulnerable to gun violence because usually students are too young to carry firearms and/or older students and faculty are prohibited from carrying them, leaving everyone effectively defenseless against malevolent gunmen (who know schools present a large number of potential victims with little chance of resistance). Umpqua Community College, site of a mass shooting, bans guns, knives longer than 4 inches and other weapons from campus. But that policy has one big exemption that renders the pastoral 100-acre campus near Roseburg anything but a gun-free zone: Everyone with a concealed firearms license is allowed to bring guns on campus. That is because a 1989 Oregon law forbids any public body except the Legislature from restricting the rights of concealed weapons permit-holders to bring guns where they wish. Proponents of gun rights have seized on [the] tragic killing of eight Oregon college students and their writing instructor as evidence that so-called gun-free zones, or places where all guns are banned, are especially dangerous because a gunman plotting a mass killing will know there is no armed person there who can stop him. Proponents of gun restrictions have shot back with their own take on gun-free zones. The college’s no-guns policy seems to be obvious evidence that the Umpqua campus was such a place. But Oregon gun owners with concealed firearms licenses know those licenses entitle them to carry loaded guns in nearly all public places. Guns, including handguns and rifles, are allowed on campus for people who have passed all background checks and conditions to qualify for a concealed weapon permit. Many Oregon college and university leaders dislike having armed people on campus, and public colleges have tried to make rules prohibiting the practice. But the courts have ruled those policies invalid when it comes to licensed permit-holders. The following year, the Oregon Senate considered a bill that would have again prohibited the carrying of guns onto school, college, or university grounds in the state. That legislation lost by a single vote. John Parker, a 36-year-old Army veteran studying to become a drug and alcohol counselor, is among the UCC students who hold weapons permits and bring guns to campus. He had his gun and his license with him on campus when the shooting took place. He was in the college’s veterans center, just a few buildings away from Synder Hall, with some other students who were similarly permitted and armed. A college employee talked them out of leaving to try to use their guns to save others. The active shooter could have taken them down first. Law enforcement officers already on the scene would not have known their guns would be used to defend students and instructors, not hurt them, he said.